“et”.. just two letters that make all the difference. Today Gandhiji is cringing because there is a huge crowd of “politicians” standing in front of his statue in Delhi and asking for a rollback of the demonezation. For 14 years, many so called “leaders” used a particular riot in Gujarat to demonize one man – Narendra Damodardas Modi. On May 16th 2014, the people of India, voted the very same man to power with a thumping majority…. and what a nightmare it was for these “leaders” as they realised that all their efforts went in vain. Efforts that included innocuous stuff like planting false stories in the press, calling this man vile names and all the way to funding riots, allegedly fudging the reports of the Intelligence bureau and using articulate thieves to paint him in a corner. I have a simple question for anyone who is rational – why would anyone go to such lengths to put down a person? Unless they perceive a real threat. What threat did Modi pose ?? Look at the history of the people who have been trying to frame Modi as non-secular, communal etc etc etc. The front runner in this framing game has been the Nehru parivar. The same Nehru parivar, that has been passing on India to successive generations of theirs as though we weren’t a country but a baton or a piece of jewellery. Their best bet today is a nincompoop who smiles vacantly as his Italian mom smirks out an acceptance speech after their personal proparty “Indira National Congress” loses to BJP. Public memory is short – the INC, Indian National Congress died when Lal Bahadur Shastri died and Nehru’s daughter Indira split the INC to form Congress (R). The INC was barely alive as Congress (O) and finally Congress (R) was recognised as the official INC by the election commission. The Nehru parivar has been rather kind to India – they always spoke the truth, probably the only lesson they learnt from the Mahatma. Daughter Indira liberates Bangladesh on one hand and gives the clarion call to the nation “garibi hatao” (“remove poverty”) on the other. Her sons and the entire nation helped her family do just that – in 2013, her daughter-in-law was declared richer than the Queen of England !! Here’s the news article – http://www.dnaindia.com/india/report-sonia-gandhi-is-richer-than-queen-elizabeth-and-the-sultan-of-oman-claims-huffington-post-report-1928180. When Indira Ji was assassinated her wonderful elder son, naturally assumed the throne. The INC being the personal proparty of the Nehru parivar, of course. The son too spoke the truth – “when a big tree falls, the earth shakes”. The Earth was reduced to Delhi and the shaking happened only to our sardar brothers and 3500+ Sardars were killed in the 1984 riots :(. When the son too was assassinated, the daughter-in-law took charge after the appropriate time for mourning had passed and the way she took charge should have given us an idea of her mettle. Read about poor Sitaram Kesri and how an elected party chief was removed – http://www.dnaindia.com/lifestyle/report-the-sitaram-kesri-case-how-dynasty-trumped-ethics-1564149. But again, I completely appreciate the Nehru Parivar’s deep commitment to truth and their inner voice always speaks the truth. After meandering through history let me come back to my question – what threat did Modi pose to the Nehru parivar? The biggest threat was loss of continuity. There ends the “dynasty”. There also ends their power. There also ends their opportunity to write about Pappu in textbooks and shove it down our throats. Thats a huge loss. And look at this man Modi, he goes and demonetises 500 and 1000 rupee notes !!!! without informing us, the grand-daddies of corruption. The man is in deep pain and dear Ambika ji needs a break badly from a prolonged break. Demonizing NaMo is easier than demonetizing. The other two people who have taken the demonetization drive rather badly are Mamata di, the universal sister from Bengal …. of the sarada-scam ohhh the sarada-fame and the No.1 true Modi-bhakt of India, Arvind Kejriwal. Mamata di has her reasons, and poor thing she has just seen money … to be told that all of it is up in smoke is heart wrenching. My condolences to her. Arvind Kejriwal should ideally have been hailing this move – his very existence in the political scene today is because he was an anti-corruption crusader. Why is he opposing the move? Is it because the anti-corruption money that he had to deploy in the Punjab elections has vanished suddenly? I have several more questions, but then I read these two articles – https://www.quora.com/Why-is-Mamata-Banerjee-not-supporting-the-ban-of-500-and-1000-notes-to-fight-corruption and http://www.livemint.com/Opinion/AyRjeSmAkHdkydUlZQnlmL/Modis-demonetisation-drive-may-damage-Arvind-Kejriwal-the-m.html and everything was quite clear. Both these people cannot support the move…. for their own survival. The classic statement was from Akhilesh Yadav, son of Mulayam Singh Yadav from his first wife… “black money has helped the economy during global recession”. People really do strange things when they are tortured. Just imagine, how much of torture Akhilesh, his dad, his step-mom, his uncle, his cousin who tore up papers and threw at the Lok Sabha speaker today (such good upbringing these children have) and his uncle from a different mother – Azam Khan would be going through. Their hard looted money, all gone. Only they know how black money helps the economy, all the great economists – Keynes, Kahnemann, Stiglitz, Sollow etc please queue up to learn from these gurus of economics. They will tell you how black money helps the economy during times of global recession !! 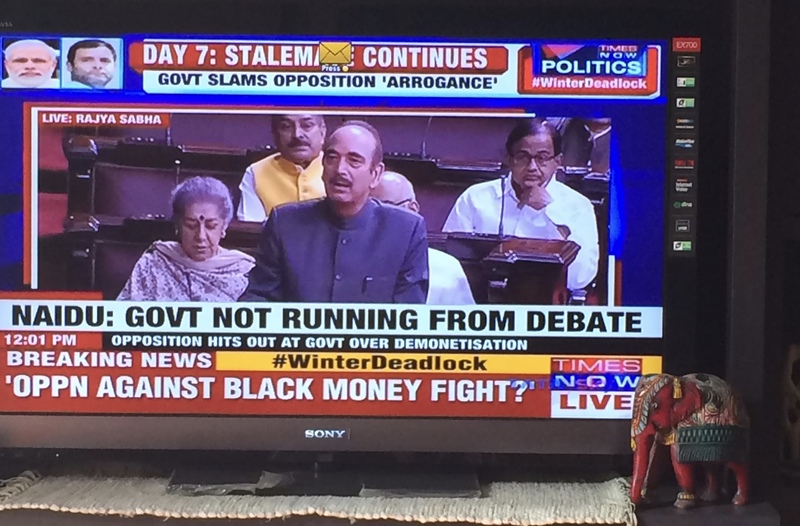 Today morning these “politicians” and dear Pappu, who have everything to lose and have already lost a sizeable loot with the demonetization move, were standing with placards in front of Gandhiji’s statue. Noticeable in all this political drama is the absence of the Orissa CM Naveen Jindal and arch rival of NaMo, Bihar CM Nitish Kumar. Naveen Jindal is working to help the move succeed because he is clearly not impacted adversely. Nitish Kumar is supporting it because it helps him kill two birds with the proverbial one stone – Sweetheart Lalu Yadav’s money power is suddenly diminished and his personal integrity is above question, so the move does not affect him at all. Nitish Kumar has earned back a lot of respect from many quarters… he had lost a great deal when he shook hands with Lalu and had to make a 9th-fail-hardly-Tejashwi Yadav as the deputy CM. Poor Lalu, all that money that he robbed from the cows cannot even be fed to the cows now. Oh this kalyug, is terrible. Karma catches up real fast. An independent survey done by C-voter says most citizens are happy with the demonetization move. 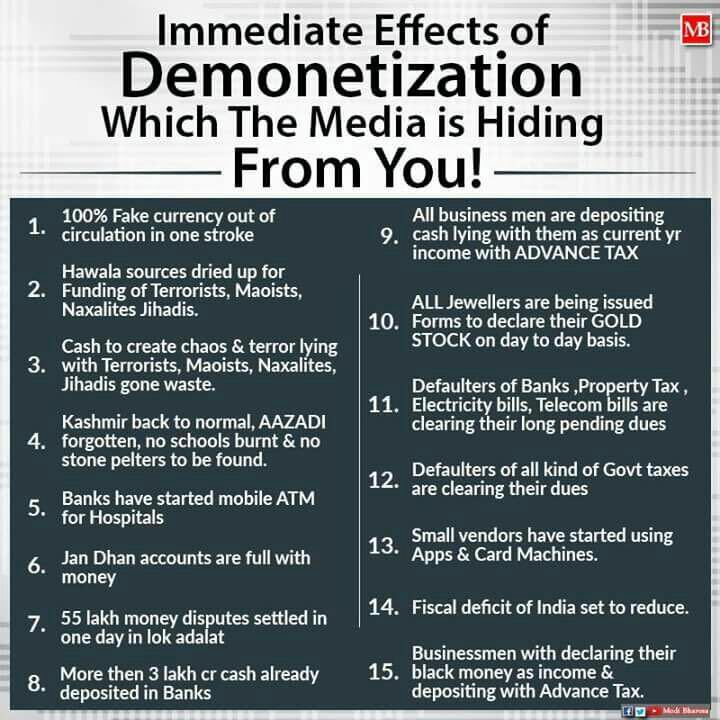 They would infact not back Modi if he gives into political pressure and rolls back this demonetization. Here is the report – http://economictimes.indiatimes.com/articleshow/55578228.cms. C-voter is the same company that does the opinion polls and exit polls during state and general elections. Hopefully they have been paid by all the political parties to not be partisan to any one. Also read this article by ISB professors that calls the bluff of all these protesting politicians – http://www.livemint.com/Opinion/s6Wp9DGoeQK8FevHSsRTHO/Demonetization-Are-the-poor-really-suffering.html. My suggestion to the political parties – the party is over buddy, India is now a place where anything can happen. Our Prime Minister not only has a spine, he also has India’s interests in his heart. His actions may be wrong sometimes, but his intention is unquestionable. All those who hate the man, please look at facts …. he hasn’t taken a day off since becoming the PM, there hasn’t been a single scam in the last 2.5 years of his government, world leaders eat out of his hand, he has made every effort to make the government transparent, we are power surplus, the list just goes on … these are not done by someone who is looking to fill his personal coffers. Am a fan of our Prime Minister – because he puts India first, every single time. A parting shot …. to help ease the pain of standing in the queue.